Inevitably, the majority of those visiting this site looking for vintage watches for sale will be drawn to our selection of classic Rolex models. Quite simply, Rolex is unquestionably the most collected, talked about and revered vintage watch brand on earth. Items by Rolex exert such a stranglehold over the market that it is often difficult to convince novice collectors to even consider watches by other makers. Look at the results list from any Sotheby’s, Christie’s or Bonhams fine wristwatches catalogue auction sale held over the last three decades at any of their UK or overseas salerooms and you’ll quickly recognise that virtually all the highest prices achieved related to pieces produced by Rolex. Vintage Rolex watches are beautiful things that were brilliantly designed and manufactured to a remarkable quality standard, but the truth is that anyone limiting themselves to a Rolex only collecting strategy is missing out on an awful lot of very worthwhile material. The vintage watch field is not made up entirely of the back catalogue of the Rolex company and in fact, there are plenty of other watches that are of exactly the same quality, and are of equal historical importance, which can be bought at considerably lower price levels than their Rolex equivalents. There is a certain irony in the fact that Rolex, given its dominance in the luxury watch marketplace today, is actually a far more modern company than most of its competitors and initially, wasn’t even Swiss. The Rolex story began when a young German émigré, Hans Wilsdorf, set up in London as an importer of watch movements from Switzerland. His business partner at the time was his brother in law Alfred Davis and collectors will be familiar with the very early case back stamp of “W & D”, the initials of Wilsdorf and Davis, inside Rolex watches from the World War I period. In 1912, as a deliberate move to lose the German sounding Wilsdorf name at a time when anti-German feeling was running rampant among the British public, the concern formally changed its trading style to “The Rolex Watch Company Limited”. Rolex watches, then and now, were of superb quality, but it is important to understand that they were not superior to those by Omega, Longines, Zenith, IWC and the other key houses. They were certainly equal to those by these already famous brands, but they were not in any way better. There is a view held today by the general public that a Rolex watch is, by some magical feat of design, innately superior to all others on the market. This is nonsense. Rolex movements, particular those manufactured in the golden era before the 1970s, are remarkably well made examples of ultra-competent and often very innovative engineering, but equally, so are those by the brands stated above. Where Rolex came into its own initially was in wrong footing an established and very conservative industry, coming from a position as an unknown at the back of the pack to being a front runner in a space of just a few short years. This was achieved by astutely recognising that the newly introduced wristwatch, widely adopted for its convenience by British officers serving in the trenches of World War I, was the future at a time when all the other traditional houses regarded it with distaste, grudgingly adding wristwatch models to their ranges but regarding them as little more than a transient fancy that would hopefully quickly pass away. If Rolex had fought with the already established major houses in the field of pocket watches, there has to be a question mark as to whether it would still exist today, or in fact have even made it into the 1930s. Why would anybody choose a product by a fledgling company with no track record, however high quality it was, when a similar item by a prestigious maker with a long and illustrious history could be bought for a the same price ? But largely because this was a new field without an established pecking order, the astute Wilsdorf was able to position Rolex as the pre-eminent name in wristwatches by the end of the Great War. Having entered the 1920s in a very strong position, the challenge for Rolex was always going to be keeping the lead that it had established. By this point, Omega, Longines, IWC, Zenith and the other traditional grand Swiss houses had all accepted that the wristwatch was there to stay and were producing some remarkably fine models of their own. Staying in front was initially facilitated by the invention and patenting of the Rolex Oyster, the world’s first reliably waterproof wristwatch, with its distinctive milled edged threaded back and screw down winding crown. From the introduction of the Oyster in 1926 onwards, the Rolex range could be effectively split into two distinct categories, these being Oyster ( waterproof) models and non-Oysters, which included the various rectangular and art deco themed pieces and most of the ladies’ models. While nobody in their right mind would take any vintage wristwatch today anywhere near water, originally, when they were new, the antique Rolex Oyster models offered for sale on this website were capable of being submerged in water without sustaining damage. This was an important selling point to the general public and by heavily patenting the ingenious Oyster case design, it effectively put Rolex into the position where it could offer a unique product that its competitors couldn’t really challenge. They certainly tried and the early waterproof watches by the other major houses are some of the most interesting, and desirable, of all to the modern day collector, but they remain as quirky, heroic failures that didn’t really pose any great threat to the Rolex Oyster when they were new. In its early years, Rolex was very much a design powerhouse and many of its watches launched between the two World Wars are astonishingly attractive. Rolex was quick to react to changes in fashion, offering ancient Egyptian styled cases in the early 1930s to capitalise on the public’s fascination with Howard Carter’s discovery of Tutankhamen’s tomb in 1929 and coming out with a selection of military themed model names like Oyster Army, Oyster Commander and Air-Lion in the years during and just after World War II. Realising that it should never rest on its laurels in technical terms, the internals of Rolex watches of this time evolved rapidly. It is fascinating for the collector to take a vintage Rolex movement from the 1920s or 30s and compare it to its closest equivalent from the immediate post-war period, noting the changes that occurred over a very short length of time. Long before it became the ultra-conservative establishment bemoth that it is today, Rolex was still a young company that was driven, daring and innovative, and it is fair to say that no other brand contributed as much to the development of the modern luxury wristwatch as we know it now. 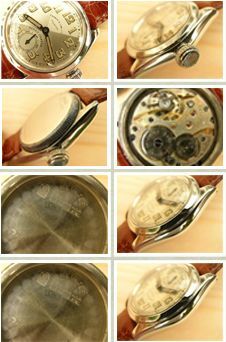 Of particular technical interest are the much sought after “bubble back” models, so named because of their deeply domed case backs, which were the first self-winding watches to be offered by the company, and still the evolutionary DNA from which current automatic models are descended. It’s fair to say that Rolex reached its apex in terms of quality in the 1950s and 60s. If you purchase a well preserved Rolex watch from this period, you’re pretty much getting the highest standard of build and finishing that has ever been offered by the Swiss watch industry at any time. There are some very compelling reasons for purchasing a vintage Rolex in the UK rather than elsewhere. It is easy to forget that Rolex started life as a London based, British company and in the years before World War II, concentrated almost exclusively on the British market and the wealthy former British colonial countries, with a strong presence in India and, to a much lesser degree, Africa. It was only in the years following the war that Rolex watches began to be imported into the USA and even today, the selection of authentic, investment grade pre-1945 vintage Rolex watches for sale there tends to be limited to those items that have been purchased by dealers from UK sources in the last twenty years for re-sale on their side of the Atlantic. Some of our best customers have been, and still are, Americans wanting to build up strong early Rolex collections who have simply been unable to find sufficient variety of the grade of watches they require in their own country. The UK has always been the best place in the world to find museum standard antique Rolex pieces from the Great War period and the 1920s and ‘30s. While they tend to be expensive here, particularly if bought in London where business overheads are some of the highest on earth, untouched, entirely authentic early Rolex watches can be sourced even now from established specialists, like us, that simply couldn’t be found in other countries. Having been in the vintage watch field for over twenty five years, we certainly have the contacts, both with established collectors who may sometimes be tempted to sell, and from within the antiques trade, to keep unearthing early, completely original, Rolex rarities. Having supplied a large number of very memorable vintage Rolex watches over the last three decades, we have a pretty good idea of which collectors have which models in their collections and are often first in line to buy them back if they are ever liquidated. Some of the rarer and more outstanding watches have actually passed backwards and forwards through our hands three or four times and have become almost like old friends ! If we were to state that vintage Rolex watches offer good value for money, we would be guilty of taking money under false pretences. In almost every instance, vintage Rolex models are overpriced when compared to their closest equivalents by other top tier makers and if obtaining excellent value for money is a significant objective when purchasing, there are much better options in the antique watch world than those by Rolex. We can say exactly the same thing about classic Ferrari, Aston Martin and Bugatti motor cars. These are very much, like Rolex, the most desirable and glamorous commodities in their particular category, but the fact that so many collectors are chasing a very small pool of available worthwhile cars means that in the case of all these marques, a premium will be paid to purchase. You simply can’t find an original Aston Martin DB5 from the mid-1960s at a bargain price because the model has become an icon, and the same applies to really clean and authentic classic Rolex material. Vintage Rolex watches are difficult to find in original, authentic condition and, as people involved in their sale as a serious business, we can state from years of first hand experience that they are much, much harder to track down and buy than they are to sell. Worldwide demand and a certain indefinable aura with the general public keeps prices for genuinely good ( and by this it is meant all original and in excellent condition) early Rolex pieces very high and the collector of these watches must accept from the outset that he is paying over the odds to own something that an awful lot of other people would like to have in their hands. 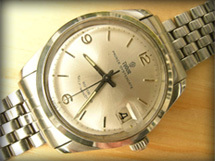 Having commented that vintage Rolex watches offer less in the way of initial value for money than those by Omega, Longines, IWC and the rest, it seems only correct that the full balanced picture is painted by adding that, over the past twenty five years, none of the watches by any of these other brands have appreciated in value to anything like the extent of their early Rolex equivalents. Vintage watches by all of the famous brands have climbed sharply in value and, most importantly, never dipped at any time in the last three decades despite the prevailing economic climate, but Rolex pieces have been noticeably outstanding in this respect. As investments, though they have always been very expensive to acquire in the first place, they have been unparalleled. Constant and increasing pressure on a steadily diminishing pool of good, particularly pre-war, Rolex pieces, means that the cost of acquisition at any point in time is very high, but even five years down the line, prices have climbed so dramatically that, in retrospect, this no longer seems to have been expensive. Having advised that if value for money in abstraction is the number one priority, without looking ahead to maximising future worth, Rolex wouldn’t be the best choice, in fairness, it has to be said that if investment gain is the long term objective and watches bought now are to be liquidated for as much profit as possible after a few years of ownership, then undoubtedly, rare vintage Rolex watches should always be a buyer’s first choice. The hard factual evidence is there that anyone who invested their money in near mint, original vintage Rolex watches at any time over the last quarter century and sold these a decade later would have made an enormous percentage profit on their capital outlay. As the number of newcomers to the vintage watch collecting field grows every year and buyers at the time of writing are looking for safer and more tangible alternatives to conventional investments in the financial institutions, there is no suggestion that any kind of slow down will happen in the foreseeable future. Vintage Rolex pieces are probably best regarded as being the blue chip shares of the watch collecting world. They are expensive to buy, but on the other hand, are firmly established as very safe, very high performing investment vehicles. As hardened vintage watch specialists, we should be immune to the allure of early Rolex models but, if we’re honest about it, we must admit that we are just as much under their spell as the rest of the world. We hold our hands up to the sky and tell our customers time after time that if they would only look at our selection of vintage Omega and Longines watches, they’d be getting Rolex quality at a substantially lower price level. But it would be hypocritical not to come clean and say that we were new collectors starting out today, we’d find it almost impossible not to hand over our money for a good World War I era Rolex officer’s watch or art deco themed Rolex Oyster from the 1930s. In the final analysis, vintage watches are emotive purchases that are driven by very personal taste and the satisfaction of owning something that is both rare and valuable. For many buyers, simply holding an immaculately presented Wilsdorf & Davis era Rolex from 1915 or 1916 in their hands, knowing that it represents the very humble beginnings in London of what has developed into a worldwide household name, would be worth the price premium they would have to pay over the amount needed to acquire a similarly specified model of the same age by one of the less well known houses. The fact of the matter is that we’re all drawn to these exotic pre-war Rolex watches, but just at least to have a balanced view of what the other makers were offering, we would suggest that anyone in the market for a high grade vintage watch, either to wear or purely as an investment, browses through the stock pages on this site and gets an idea of what is available outside the Rolex sphere.